EastSouthWestNorth: Who Painted the Mountain Green? Who Painted the Mountain Green? (yWeekend) Who Painted The Mountain Green in Fumin county, Yunnan? By Ma Jun (马军). March 8, 2007. Someone said: "The Bureau of Agriculture and Forestry people did it." Someone said: "A decorator company boss did it for his own fengshui." Someone said: "The truth has not been confirmed yet." One incident. Three reporters. Three versions. What is the truth about the "green paint on the mountain in Fumin county, Yunnan" incident that shook up the nation? Does the local government bear any responsibility? Was this the act of an individual businessman? People cannot help but wonder: who is the real "decorator" behind the green paint job on the mountainside? Reporters from Xinhua, New Life News and Metropolitan Times went to the scene and filed reports. But how did they come to three different conclusions? yWeekend contacted the three reporters and asked them to describe their processes of news gathering as well as their views on the matter. 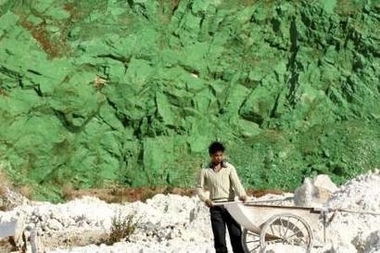 On February 13, the "green paint on Fumin (Yunnan) mountainside" incident was first disclosed by Metropolitan Times reporter Zhang Ke (张科): According to local residents, on last July/August, a dozen workers brought some paint to the idled quarry mine on Laoshou mountain in Fumin county and spray-painted the huge exposed mountain face in green. The "greening" workers told the villagers that they did so at the behest of the Bureau of Agriculture and Forestry. This 'face project' led by the Bureau of Agriculture and Forestry costs over 400,000 RMB. If the same money had been spent on plant seedlings, "it could be used to cover several mountains." The reporter interviewed workers at the Bureau of Agriculture and Forestry and they admitted that the bureau leaders ordered people to do this. This report was carried by the media across China and aroused netizens to make condemnations. On February 15, New Life News reporter Tong Weiqiang (汤伟强) interviewed the director of the Fumin county Bureau of Agriculture and Forestry. According to the director: the paint job was the action by a Boss Du of a decoration company and it had nothing to do with the Bureau of Agriculture and Forestry. However, this reporter was unable to confirm with Boss Du personally. On March 2, the Xinhua "Focus Internet Talk" section published the essay <The Trouble Caused by Fengshui: The investigation of the truth behind the greening of the Yunnan mountainside>: A few days ago, the Xinhua reporter had made an in-depth investigation in Fumin county (Yunnan province) and found that the "green mountain" incident had been exaggerated and inflated ... the 2,800 square meters of mountainside that had been painted green was the handiwork of a local decoration company boss -- his house faces this mountain and he 'decorated' the mountainside out of fengshui considerations. The reporter Chen Peng from the Yunnan bureau of the Xinhua news agency was able to interview Boss Du in person. After the Xinhua report was published, there were still many doubts. Generally speaking, netizens held on to their own positions and there were many viewpoints. Why should there be divergent reports on the same event? How could three reporters come up with different narratives? The Xinhua reporter said: Boss Du's explanation is more credible; the whole affair has been exaggerated. The New Life News reporter said: Boss Du's explanation is suspicious; it is still impossible to say whether this was an exaggeration. The Metropolitan Times reporter said: He will assume responsibility for everything that he wrote. So what is the truth? Perhaps this is like what the Xinhua reporter suggests: the reporters can only describe what they saw and heard; the readers will have to make their own judgments. Chen Peng, reporter with the Yunnan bureau of the Xinhua agency; 32 years old; 8 years of experience as a reporter. Why did I follow up on this matter? First of all, it was the reaction of the foreign news coverage. The media in Japan, United States, United Kingdom and other countries reported on this matter. The Guardian (UK) recently published <China's green pledges are as deep as a coat of paint>. No matter whether this is sarcasm or criticism, the jabs were very sharp. But none of the foreign correspondents actually went to Fumin county. They based their reports solely upon the initial report in Yunnan's Metropolitan Times. It is unreasonable to condemn the environmental policies of a nation solely on this basis. Therefore we wanted to run a report to clarify things. Of course, we cannot have a pre-established position. We did plenty of interviewing, including with Boss Du, the villagers, the county publicity department, the Bureau of Agriculture and Forestry and so on, so that our report had a firm basis. My report basically reflected what those people said. I think it was quite objective. Of course, I cannot thump my chest and tell you that the county government had absolutely nothing to do with this. What I reported was what I heard and saw as a reporter and then objectively presented for the readers to judge. Such was the reason why I did this report. I located Boss Du on February 27. I told him about my purpose. At first, he was resistant. He said, "Again? Reporters have been calling all day. This is so annoying." I told him: "I'm from the Xinhua agency. We want to put a satisfactory end to this matter and tell the truth to the public. Otherwise, the foreign media are hyping this matter up and that is not good for the image of China." Having heard that, Boss Du became more cooperative. He let me come into his house and interview him. At first, we were quite suspicious: How was this possible? The mountain was quite faraway from Boss Du's house at about 1 kilometer away. How could a private businessman have so much money to paint a mountain? How credible is this story? I used the method of elimination. That is to say, we cannot prove that the county government has any connections with Boss Du or not. Under these circumstances, we can only try out best to see if Boss Du's explanation was credible. During the interview with me, Boss Du was initially reluctant to discuss fengshui. He only said: "I wanted to do something good for Fumin county. I have been here for twenty years, and I wanted to pay Fumin county back." After repeated probing from me, he finally admitted that this was related to fengshui. Based upon my years of experience as a reporter, he would have covered the whole matter like a blanket if the county government had given him instructions. So why was he unwilling to bring up the fengshui thing? That was very meaningful. His reluctance to mention fengshui at first meant that he was being truthful. What he said was not quite rounded out at first, which meant that it had been deliberately crafted and scripted. Therefore, I thought he was relatively credible. From the second-floor verandah in Boss Du's house, I could see the big hole in the side of the mountain. This confirms the relevance of the fengshui factor. After the report was completed, we were still worried that he might be lying. So we came back secretly to interview his neighbors. The old folks confirmed that his family was very superstitious. I also paid attention to the settings inside his house, and it contained more superstitious flavor than other homes. This included burning joss sticks on both sides of the door, the octagon board and evil-warding mirror on top of the door and the Buddhist prayer room inside the home. The neighbors also said that the family had hired the service of a fengshui master. Overall, we did not believe that he was working on an assignment given to him by the county government. It was more likely that he did this on his own. This whole affair has truly been exaggerated. First of all, the initial report characterized the area as a deserted mountain. This was inaccurate. This was not a deserted mountain; this was an abandoned quarry mine. There are trees elsewhere on this mountain. But the quarry mine was a steep stone cliff on which it was impossible to plant. Secondly, the numbers were wrong. Metropolitan Times said that more than 400,000 RMB were spent. This number is impossible. You only have to go to the site and take a look. The mountain face was less than 3,000 square meters in area. No matter how you want to paint it, it could not possibly cost more than 30,000 RMB. We consulted many professionals and they agreed with this opinion. Boss Du is in the decoration business, so how could he not know? The Guardian (UK) mentioned "30,000 British pounds," which was calculated from the 400,000 RMB figure. This was obviously exaggerated. The Guardian (UK)'s report was re-published in <Internal Reference News> in a prominent position, so this figure became well-known. Also, the environmental impact of this action was exaggerated. Even though the locals painted the mountain green, the Kunming city department of environmental protection director said that they had organized people to conduct tests and did not find any environmental damage from the paint. We interviewed some local people and they thought the place looked better with the green paint. It used to be a deserted mountain face and it looked worse before. Tong Weiqiang: Reporter with New Life News; seven years of experience as reporter. When we went to gather the news, we were speculating: Was Boss Du a scapegoat? What was his connection with the local Bureau of Agriculture and Forestry? If an individual did it, the blame was smaller and the public opinion lashing was less. But when we went to Boss Du's home to seek confirmation, we sensed that he was uncooperative. We did not know why. Before the Chinese New Year, I interviewed Boss Du by telephone. At the time, he had gone home in Sichuan and therefore I cannot observe his facial expressions to determine whether he was telling the truth or not. We went to his home the next day, but we could not get any confirmation from his wife. That was the first time that we went to his home. It was February 14. His wife was at home and she opened the door. As soon as she heard that we were reporters, she slammed the door and refused to open it in spite of repeated knocks. At the time, we thought that we had to see Boss Du when he returned. After the Chinese New Year, we learned that he had returned and we went to visit him. But he hid from us. Later on, we were unable to follow up on the story, precisely because we could not locate him and the matter could not be verified as a result. Recently, the Xinhua reporter held a face-to-face interview with him. So I went back yesterday to look for him. I still could not find him. His wife was cursing at me from the courtyard. She was using obscenities. It was not pleasant to hear that. Although I never met Boss Du in person, we spoke several times by telephone. There were some suspicious points. For example, he claimed to have been the sub-contractor for the village cafeteria. We went to the village brigade leader for confirmation, and we were told that Du had not been the sub-contractor. What does this show? This shows that some of what Du says is possibly untrue. It is not possible to see the green-painted mountain from the first floor of his house because there were obstacles in between. That was according to our sense, not by our direct observation from inside the home. From the door, it is not possible to determine if this family was particularly superstitious. The Xinhua report cited that there were burning joss sticks by the front door, but we did not see that. There was an evil-warding mirror on top of the door, but one can say that every home in the village and the town has one of those. This can be said to be a custom in Yunnan. The people in the county government may also believe in fengshui, but we are unable to prove that. A mutually confirming evidence set needs at least two or three pieces of evidence. But we only have Boss Du making this assertion and he was unwilling to meet with us. If he has nothing to hide, why does he keep avoiding us? Do we need to use a lie-detector? We thought about it, but this was unworkable (laughs). We tried to get to the truth of the matter. 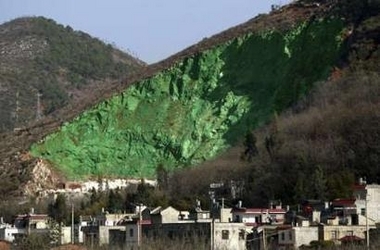 According to Boss Du, he consulted a fengshui master and then he decided to paint the mountain green. Did he consult a fengshui master? That is another path of inquirty to establish some proof. We must first locate that fengshui master. We have an informant in Fumin county who is very familiar with the local situation. He located the temple at which the fengshui master worked. But the fengshui master was not there anymore. For some reason, the temple was abandoned. Maybe the donations were not enough to sustain it. There are nothing much that we could do. We may not report on this any more in the absence of important breakthroughs. For example, if we find the fengshui master and he said that Boss Du had never consulted him. Conversely, if he said that Boss Du did consult him -- there is also an outcome which clarifies the facts. Since this site is outdoors and distant from any residential buildings (about 1 kilometer away), it probably does not pose too much danger to people. The paint job had been done a while ago, so that the danger should have decreased. When we visited the site, we could not detect much smell. In the long term, though, we cannot tell whether there is any harm to the quality of the soil. The Department of Environmental Protection has not made a rigorous report yet. It only made a verbal statement that "there is no danger." It has not explained what had been tested, the results of those tests, the national standards and so on. None of that has been released to the public. We have come across this type of situation before. We once reported on a case of water contamination at a certain place in Yunnan province. Before the matter was reported, the Department of Environmental Protection conducted tests that showed that the water was poisoned with various standards being exceeded. As soon as the media reported on the situation, the same department ran tests again that showed that the same water was trouble-free and even better than mineral spring water. Yet, the incidence of gall stone among local residents was 20%, which is far higher than the normal level. That is to say, whenever something happens, certain departments do not want to get to the truth but prefer to cover up instead. Therefore, it is hard to say whether pollution had occurred here. I interviewed deputy director Yang of the Fumin county Bureau of Agriculture and Forestry. Due to the pressure coming from the first report, he quickly agreed to the interview. He said that the action was taken by the local decoration company owner Boss Du. The Bureau of Agriculture and Forestry gave tacit approval. After the first report by Metropolitan Times came out, the Fumin county government submitted an investigative report to the relevant departments to explain what had happened. The report claimed that Boss Du did so on his own, and the county government neither supported nor opposed the action. The report also mentioned that "before planting could occur, this action has the effect of making the sight more beautiful on a temporary basis." Later on, the Fumin county publicity department leader said: "This case was exaggerated." The 470,000 RMB figure was very much inflated. But that figure was probably not made up by the reporter. It probably came from certain local villagers. Other than that, it is still not possible to come to a conclusion at the time. We can say that the affair was exaggerated, but there are certain key issues that have not been verified yet. Who did it? How much was spent? Those are the two key issues. The former -- who did it? -- is the most critical issue. Zhang Ke: Metropolitan Times reporter. Zhang Ke told yWeekend that it was inconvenient for him to discuss the case at this time. But he emphasized that he was willing to accept responsibility for everything in his report. He explained that this matter is very tricky. After his first report went out, the Chinese websites carried it and many media (including several CCTV programs) called him up. The Beijing-based correspondents for foreign media also called him up. At this time, the relevant people have instituted certain rules in consideration of the overall situation and therefore it was inconvenient for him to disclose certain "inside information" about this case. Q: How did you obtain the tip about this case? A: It was before the Chinese New Year, and I was in Fumin county for some other story. Local people gave me this tip. A farmer told me that a mountain had been painted green and he suggested that we check it out. So we obtained this tip by chance. We went over there to investigate and we interviewed the relevant departments. Q: When the deputy director of the Bureau of Agriculture and Forestry was interviewed afterwards, he claimed that it was an act by a private company boss. So now people are wondering whether your first report was inaccurate. A: If it was an inaccurate report, Fumin county would have come after me. They would have gone through various departments to punish us. As of now, Fumin county has not contacted me and they have not told our newspaper that the report was inaccurate. If the local government should come to me for proof, I can answer all the questions. I am able to respond to all the questions that you posed. But since the relevant people want the affair to come to a stop, I can only say that I am willing to accept responsibility for my report. I am unable to discuss the details. Under these circumstances, I can only say sorry to you. Q: In your report, you said that the paint cost 470,000 RMB. Later reports said that the amount was far less. A: As for how the expenses were calculated, there are many ways and methods. We definitely have our own reasoning, including some things that the outside world does not know yet. But it is not possible to talk about it now. (The Guardian) China's green pledges are as deep as a coat of paint. Isabel Hilton. February 20, 2007. Fumin county, a hitherto obscure district in southwest China, became the object of international mockery last week when news reached the outside world that the bare slopes of Laoshou mountain had been painted green, to the bewilderment of the villagers and at a cost of about £30,000. Reports were divided about who was responsible. Many blamed local bureaucracy, others a Mr Du, a businessman who had made some of his money from the quarrying that had wrecked the mountain's beauty. He had done it to mitigate the negative feng shui affecting his business, though the idea that negative feng shui could be changed with a few hundred litres of paint must cast a few doubts on the claim that it promotes harmony with nature. The episode resonates with a long Chinese tradition of confusing appearance with reality. When, in the 1950s, Mao Zedong decreed that China would overtake Britain in steelmaking within 15 years and that agricultural yields would double with the application of the correct theory, officials all over China reported that the miracle had taken place. When Mao went on tours of inspection, healthy crops were uprooted and hastily replanted along his route so that the Great Helmsman would see an unbroken vista of dense green vegetation. He was never troubled with the news that the plants died within days of his passage, and later refused to believe millions were starving. Had he not seen the bountiful harvests in the making? In the Cultural Revolution, a similar enthusiasm for theory made the poverty-stricken village of Dazhai a national model. The village claimed to have produced staggering volumes of grain through the correct application of the thoughts of Chairman Mao. The village headman was promoted to national celebrity and peasants across China were instructed to emulate Dazhai's methods, later exposed as fraudulent. Compared to the suffering both those episodes caused, painting a mountain green is a minor matter. The greening of Laoshou mountain indicates that some aspects of China have not greatly changed. In the 11th five-year plan, the economic policy blueprint approved in 2005, the Chinese leadership announced a change of emphasis that appeared to acknowledge the threat catastrophic environmental degradation posed to continued growth. Environmentalists had long pointed out China's model of development was unsustainable, but their warnings had been dismissed with an official mantra of "development first, environment later". It was an approach, the leadership liked to point out, that had served the west's industrial revolution well, and now it was driving China's economic miracle. The 10th five-year plan paid lip service to environmental concerns. It had set 20 targets, eight of which were not met. But by 2005, the signs of a potential environmental collapse and of widespread social unrest were so alarming that the 11th plan contained a major rebalancing of priorities in favour of the environment and social justice. A key target was that of reducing by 20% the amount of energy required to produce one unit of GDP by 2010 - a projected annual target of 4%. In an important shift in priorities, the government declared an equal focus on environmental protection and economic growth. To reinforce the message, environmental protection would count in assessing officials' performance. The targets, and the apparent determination to meet them, were hailed as milestones in China's environmental history. The targets sounded ambitious, but another set of figures illustrates how much room there is for improvement in China's industrial performance. It is staggeringly wasteful. Each unit of GDP takes seven times more resources to produce than in Japan, nearly six times more than in the US and nearly three times more than in India. Even small efficiency savings would clearly yield important gains. A familiar pattern set in. In the Maoist era, political campaigns were a fact of bureaucratic life. A directive would be issued, meetings would be held, scapegoats and victims identified and, after an interval, reports of its successful implementation sent to Beijing. Old habits are persistent, and what really counts for officials is still economic growth. That is what gives them status, personal wealth and promotion. Faced with instructions to protect the environment, they will put up a few posters and carry on as before. And who is to challenge them? The press is constrained, the legal system is rarely independent, there is no possibility of a change of government via the ballot box and local state environmental protection bureaux come under the authority of provincial governors, whose behaviour they are meant to regulate. The only watchdogs are the infant NGOs - underfunded and vulnerable to persecution. Even at national level, environmental enforcement is the weakest branch of government. It should come as no surprise, then, that energy efficiency targets were missed last year, and there is little prospect next year will be any different. Without profound reform, Beijing's declarations of intent are the national equivalent of painting a mountain green.